Fox n Forests is a retro inspired platformer. It has nice sprite artwork and a very old school game map. Your goal is to guide Rick the fox through the seasons and find each piece of magic bark. To do so, Rick will bring along his trusty sword and crossbow, while also gaining magic that allows him to change the season in each stage. Platforming is decent overall. Rick starts with a double jump, which is very useful. There are some jumps that feels just out of reach of the double jump, which is disappointing. It is unfortunately harder to jump over enemies and hazards than I want, because Rick's hitbox feels too big. He will frequently hit his head on things above him, which kills your jump momentum. There are, of course, bottomless pits, too. Running out of health or falling to your doom will quickly send you back to the last checkpoint. The saving grace is that respawning is so fast. The bad side is you have to pay to use checkpoints, and the cost increases as the level goes on. You can skip them if you want to save your money. I don't really like that idea, since I need most of the checkpoints. I also feel it's a way to keep your total money down, meaning you will need to replay stages more times to buy the upgrades. Combat somehow feels worse than the platforming. Rick has two basic attacks: one with a sword, and one with a crossbow. It's a great idea, but suffers from both being attached to the same button. If you are standing still, Rick will use his crossbow. If you are moving or jumping, he will use his sword. I'd really like to be able to use the crossbow more than you can. Ranged attacks help a lot, given Rick's large hitbox and how cheesy the enemies can be. I'd also love to be able to jump and shoot. It's not like that would break the game, just make it more fair, so having them as separate buttons would be great. The crossbow is weak, and has a cooldown between volleys, so you still need to use the sword. Even so, the sword had its own problems. The range isn't that good, and I frequently got hit while trying to attack enemies. The purchasable double jump attack hits a nice circle around Rick, but the single jump attack is much more confined. If it was more of an arc, it would be better, and it wouldn't be so easy to get hit while trying to use such a precise attack. The unique mechanic if the game is the ability to change the season. Each level has two versions, and using your magic effectively swaps between them. Water will freeze so it can be walked on, plants grow or retract, and fog can disappear. It's a really cool idea that is used pretty well. My only gripes with it are that you cannot activate it in the air (but can turn it off while jumping), and the activation time. When you change the season, Rick has to stop and hold up his sword. This would be fine if the rest of the game paused with him, but it doesn't. So, if you aren't careful, or constantly unlucky, you can get hit when you activate the season change. As if the game needed to get in more cheap hits. It might be less frustrating on a TV instead of handheld mode. The money you gather not only pays for checkpoints, but can be used to get potions and upgrades for Rick. Health and special move upgrades just require money, while mana and melee attack upgrades also require some collectibles. Unfortunately, you have to alternate buying special move and melee strength increases, so you will have to find some of the whetstones to get all the moves. The potions you can buy are cheap, but you need to find the bottles first. Easier said than done. There are not many levels in the game, as each section has two, a boss fight, and a bonus stage. To make up for this, the levels themselves are long. Too long for my tastes. I'm a fan of more, but shorter, levels (see Disney Infinity versus Skylanders). Especially when you can easily jump back to completed stages for missed collectibles with new abilities. Well, I say “can”, but the game means “will.” After beating a boss, you need a certain number of the seed collectibles to progress. While I usually like going back to grab missed stuff, it feels arbitrary when I'm forced to. Plus, when I’m happy just getting through a stage, given how frustrating things can get, I don’t really want to go back. However, since the levels are big with some alternate paths, you may be completing each level several times to find everything. Or without finding everything, like me. You also need every seed in a set of levels to do the bonus stage. The first bonus stage gives a little extra money, but you only get one chance to do it. Considering the work I had to put in to get it, the reward was not worth it. Parts of Fox n Forests are fun, but it feels like a missed opportunity. There are good elements, such as the different attacks and the season changing mechanic. Too bad most other game mechanics are working against you. In reality, the game is short, and has to resort to artificially drawing it out. Because of this, it feels strange to complain about each level being way too long, even though I will still do just that. Ultimately, die hard platform players looking for a challenge or something unique should check it out, but for others it's a pass. Season changing leads to some nice level designs and opportunities. Controls aren't always responsive, character's hitbox is too big, not many levels. I really appreciate the Gorgeous Gorge name. 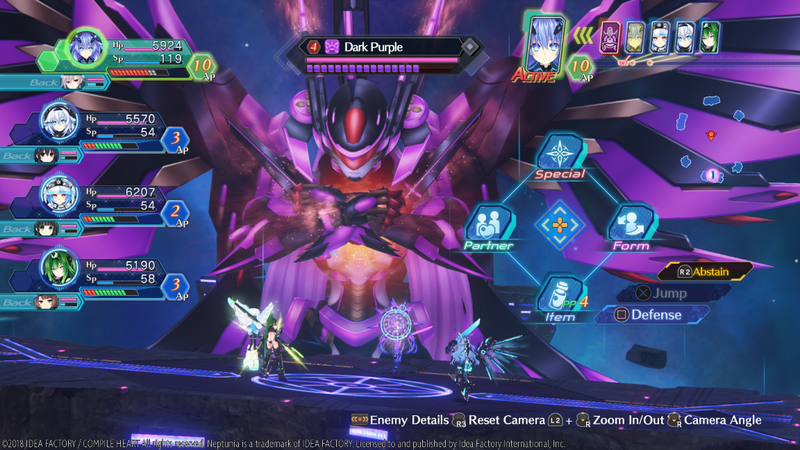 The mainline Neptunia series is no stranger to updated re-releases, and Megadimension Neptunia VIIR (Vee-two-are) keeps it rolling. Besides sounding like a new Star Wars droid, the name also clues you in to one of the biggest additions: there's new VR scenes. Thankfully, you don't need a VR headset to play the game, because I don't have one yet. 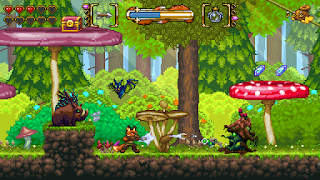 In addition, there is a new graphics engine for smoother visuals, and the combat has be revamped. For better or worse, the game starts with one of the new VR sections. You can still view it without a headset, but I imagine it would be a lot cooler with the new hardware. 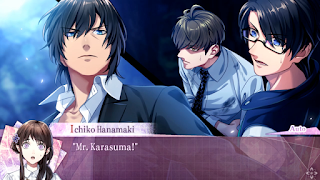 Some scenes pop up between chapters, while others have to be selected from the player's room. In fact, most things are done from this new area. It's where you can view the scenes, or jump back into the stories. As far as I can tell, all three stories from the original release are intact and unchanged, save for a few changes for the endings. The other major change in the game is the combat. Before, you would put your unlocked moves in a combo flowchart, which was determined by your weapon. It...wasn’t my favorite, not by a long shot. Now, moves require AP to use, but you can attack multiple times in a turn if you have enough stored up. Plus, you have access to all of your unlocked moves...sort of. Your weapon again determines which of the three types you can use, but you are free to use any in those. It’s certainly an improvement. The only real downside is that each move now costs money to unlock. Early on I just didn’t have enough to buy many moves, so I was stuck using the same ones for awhile. After each combo or special move, you have to select “defend” now. It’s not the most streamlined process, but it does work in the player’s favor. That’s not all. There’s now a skill that lets you heal when you de-transform from CPU form. I think that’s pretty neat, and useful. HP is fully restored after each fight, which does make the game easier and faster. SP is used for special moves, which is built up while you fight. SP build up feels a bit slow, especially in the giant battles, but the system is functional. Thankfully, the middle act now allows all players to share items. It should be less of a pain to complete. 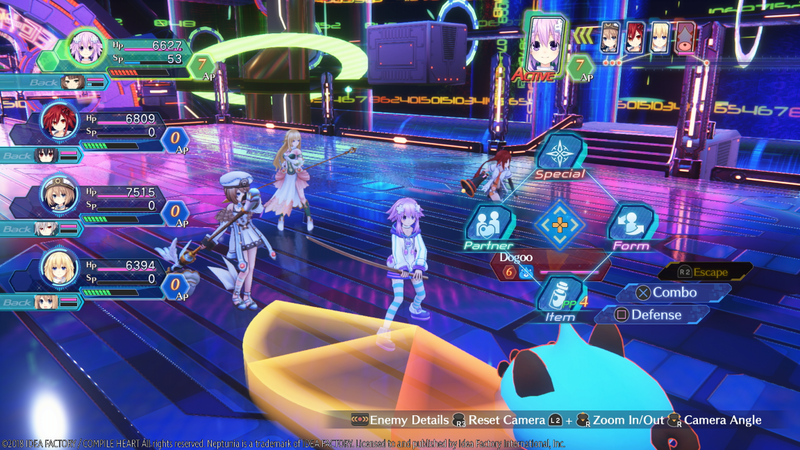 Challenges from previous Neptunia games (like jumping a lot, or getting symbol attacks) return, but with a re-tooled purpose. Before, they gave stat boosts. Now, they give bonus points that you can put into stats of your choosing. The best part is that these stat points can be re-allocated on a whim. No need to visit a special person, or use an item to respec your stat bonus, just decrease the number. Part of the reason for this is weapon balance. Now, weapons need a balance between to stats to keep a high accuracy. You can pump everything into strength, but it will eventually lower your accuracy. Keeping in mind what stats balance your weapon will still allow you to get stronger, but it’s not as simple as dumping everything into one thing. I don’t like all the changes. It might be minor to some, but the saving has changed. It’s nice that it saves so often, but it is an auto save, and it’s all in the same slot. I would think most RPG fans prefer to at least have a few slots, or be allowed to manually save before stopping. I know I do. I haven’t had any issues with it, but it makes me a little paranoid. Oh, and if you had any DLC for the previous release (yo), it sadly doesn’t work here. I can guess there was a licensing issue for some of them, but at least Umio could have been there. The new additions and reworked combat are nice, but not necessarily worth coming back for. It might be a different story if you have a PSVR. 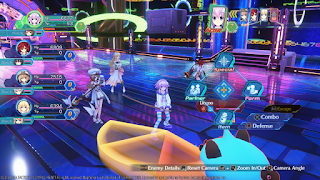 If you haven't played the first release, or wanted it to be better, then it is worth trying out Megadimension Neptunia VIIR. Combat was re-worked and is much improved. Graphics look better, too. DLC doesn't carry over from the previous release. Game is auto save in one slot. So is the next remake/rebirth game 4GO VR? The Lost Child is NIS America's latest offering for the Switch, and is, I think, the first dungeon RPG on the system. It sticks to several staples of the genre, but doesn't offer created characters. Sorry, David! It also boasts some good artwork, a nicely animated intro, and very unique monster designs. Dungeons are in first person. As you move around, the map fills in automatically. Thankfully there are shortcuts that open up, which allow you to move past explored floors quickly. It would be nice if there was a quicker way, since there's only about one save point per floor, but it's at least helpful to have these shortcuts. I would also like save points closer to the bosses. Dungeons contain a fair amount of locked doors, which you need to find the switches for, and of course the occasional puzzle to solve. There's not a whole lot in the way of gimmick tiles, which is a plus. Combat is pretty simple, but has a unique mechanic that I'll explain in a bit. Your party of five will face off against the enemies. I'm not sure what the limit of opponents is in one fight, since I've seen it go as high as 15 or so. While in most dungeon RPGs fighting more than five can be a pain, it wasn't too much of an issue in The Lost Child. Most enemies cannot attack from the back rows, but you cannot hit them either. Each member of the battle party gets one action per turn, and you can attack, use a skill, defend, or use an item. Pretty standard stuff. As mentioned early, the astral designs are very unique. Some are outright creepy. While the main character cannot use skills, if you kill an astral using the Gangour (his special gun), you will capture it. Once I got the hang of the burst gauge and the gun’s damage, it was pretty easy to capture the astrals. You can only have one of each though. Once captured, you will need to spend a little karma to purify them, and they can then be used in battle. Sometimes, special or rare astrals also require specific items before they can be purified, but you can still capture them beforehand. Astrals can be freely switched between main and sub parties, but changing one from the stock will require a bit of energy from your tablet. While the energy is limited, I haven't needed it much, and it fully refills when you leave a layer. Your main characters will level up in the traditional way, by gaining experience from battles. To level up an astral, you spend karma. I really like this, since you can boost a new acquisition, or pump up your strongest party members. They do have a max level. When at that limit, you can go to the temple and have the astral's rank increased. This resets their level back to one, gives them a tiny stat increase, and raises the max level. Their appearance also changes, for better or worse. Just make sure to save some karma after ranking them up, so you can boost them toward the level they were at before the change. Ideally, I'd want a bigger stat boost, but I think the higher level cap is the main attraction to increasing an astral's rank. Stat points are automatic (and set) for astrals, but you will have to choose which stats to increase for your main characters. Astrals also gain skills at certain levels. An interesting idea in The Lost Child is the”spirit scale”. This allows you to trade skills between astrals. I like the idea, since you can theoretically move some good skills to the astrals you use most often, but I didn't do much with the system. It's a scale, so the skills have to balance out in order to be traded. It would take a lot of time to figure out what to trade to who so you could end up with a few killer sets, and I didn't feel much need to. It would have made a few astrals better if I had invested the time necessary for working it all out, so it is something I would look in to when I have the time. Your non-astral characters can equip different armor and weapons. Most of these are found in dungeons, or unidentified enemy drops. Selling excess equipment and items is the only way to make money, as killing the enemies doesn't give it directly. At least they give out a fair amount of selling items. I only really used the money to identify items, and didn't run out. You can also get items from treasure chests, either on the field, or that enemies drop. However, each chest is booby-trapped. To open it, there are two meters. The left is the danger meter, which fills as you are triggering the trap. The right is opening the chest. Attempting to open it, or using a skill, will increase one or both meters. If you fill up the left one first, the trap is sprung and you suffer its effects. If you fill up the right one, the chest is opened. At first I liked this system, but after several hours, I grew tired of it. It would be much better if you didn't have to do it for every chest, as it just wears out its welcome. There game's difficulty spans from easy to hard. Most fights aren't that hard, but the enemy damage can be high at seemingly random times. Boss fights are more difficult. The first boss trashed me soundly. I did some grinding, came back, and was victorious. The subsequent bosses didn't feel quite as hard, so maybe I just got better at the game, or was diligent about leveling up my good astrals. When an astral dies, you have to re-purify it after the battle (it’s slightly different in R’lyeh Road). Game overs can be reversed by spending karma or money, but I usually stuck to reloading my last save. I'm just that cheap. Dungeon RPGs are a genre that have grown on me over the years. I enjoyed playing The Lost Child. The capture mechanic added something new to the formula, and I really liked the karma system for leveling up your monster party members. Dungeon RPG players should give it a shot, unless you turn up your nose at not creating characters. It's a fun game that might be of interest to RPG players looking to break into the dungeon RPG sub-genre. Easy to add new monsters to use in battle. Leveling them up is also easy, ensuring new blood isn't the weak link. I'd like more save points, or even quicker short cuts. Those dungeons get long. The treasure chest mini-game gets old after awhile. Some of those monster designs are a bit too creepy for my tastes. At least they stand out! Following in the storied tradition of re-releases, Shin Megami Tensei: Strange Journey now has a Redux. This release sees a new playable character, new endings, a new multi-level dungeon, some new story scenes, new monsters and some updated elements, such as UI changes. Sounds nice, but admittedly it's a little lost on me. I have not played the previous release, so I won't be as privy to these changes. I do appreciate the added content. Although part of the SMT series, Strange Journey is a spin-off, much like Nocturne. As such, it plays very similarly to the core games, but with a few differences. You still have demons in your party, and must recruit and fuse them to gain more. Like Nocturne, your main character is also a party member. While having a steady battle participant is good, it also means that having him incapacitated can mean game over. I actually had that happen a few times. The random aspects of battle has that effect. Fights range from simple affairs too winning by the skin of your teeth. It really depends on how many enemies appear, and if they decide to spam certain techniques. I can tolerate that, but it's far from ideal for my playstyle. Later on there is an app that prevents game over from losing the main character in battle, which I understand is one of the new additions to Redux. That's a good change! Winning a fight gives experience, but it seems relative to the strength of the opponent. This means grinding isn't that effective, which is an odd choice for a dungeon crawling-centric game. Another big gripe I have with the game is the stat gain from leveling up. It's random. I'm very much against that idea. Supposedly your random gains will favor whatever support you got from the opening personality quiz, but again, it's random. While I'm mentioning it, I'm not really a fan of quizzes like that, either. Just let me pick my focus instead of arbitrarily assigning me one based off vague answers to silly questions. Or better yet, let me distribute my own stats! In some cases, recruiting demons is easier than previous SMT game I've played. Their speech and corresponding answers make more sense than they have (to me) in past games. However, there are some cases where it is a lot harder. Demons have alignments. If they are a similar alignment to your main character, you may be able to recover from a wrong answer, or refuse more demon requests before negotiations break down. On the flip side, opposing alignments won't even talk to you. That seems a bit harsh. Later in the game, there are some ways to get a tiny chance for them to join, but it's still far from ideal. One step forward, one step back. As mentioned before, you can fuse demons in your party to create new ones. This feels very similar to previous SMT games. You can pass on a skill or two, but the resulting demon has set skills and stats. You can also pay money to re-summon any demon you have previously recruited. It's expensive, but occasionally worth it. It's a good system for passing on skills, and filling out your demon book, but the fact that the resulting demon always starts at a set level with their own stats means it doesn't always help you move forward. If you give up two level 10 demons, and they make a level 7, you are down in both power and numbers. Choosing when and who to fuse is a skill, and not one I have mastered. You can choose to pass on certain skills with demon sources, but after the first of each, you have to get lucky to get more. I'm not a fan of that, nor of having the main character's skills based off his gun, with a few from apps. Since they were updating features, it seems like there were a few that could have been made to skills and demon fusing to make it more player-friendly. Shin Megami Tensei: Strange Journey Redux was still kind of fun, despite the personal issues I have with the game. If you really enjoyed the previous release, there is enough new content to bring people back for another helping. If you were interested before, but didn't play it yet, this seems to be the definitive edition. Might as well get this release instead. People more familiar with the later Persona/SMT games should probably stick to those. New content and some good changes likely make this the superior release of the game. Too much random stuff for my tastes. I feel like the plot and early story developments are straight from some low-budget SciFi, sorry, SyFy movie of the week.